We moved to AZ a couple years ago and I discovered rockhounding....very different from what I was used to in the Midwest. So far I have found quite a bit of quartz crystal clusters, some lower grade amethyst, geodes, and AZ diamonds!!! Those are my favorite!!! I know about the diamond point locality, but are there crystals kind of all over that general area? Seems everyone is digging in the same spot!! I'm attaching some of my really good ones I have found....they are amazing and rainbow filled little jewels..:-) I have quite a few more, but not like these ones. Welcome to the forum. Really nice finds. 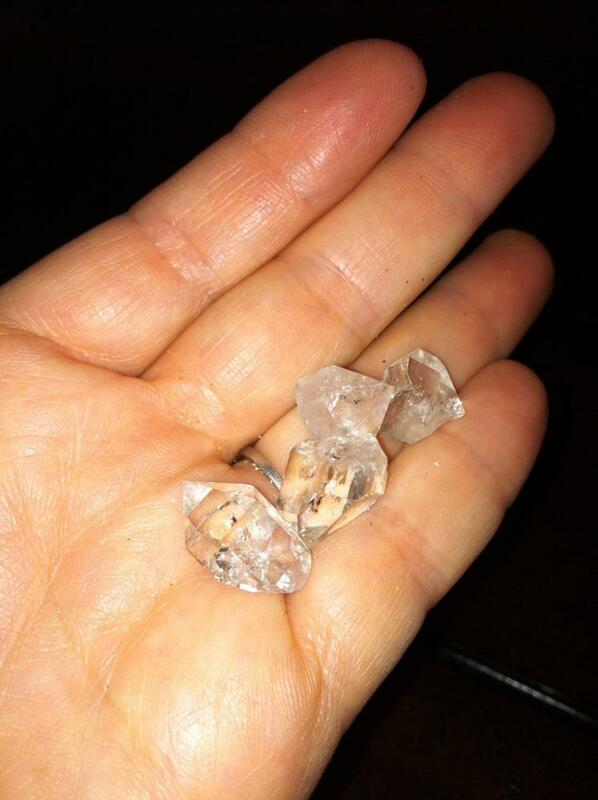 They do look like herkimer diamonds. I'm sure there's many more out there with your name on them. Crystal are always exciting to find. Those are dynamite! 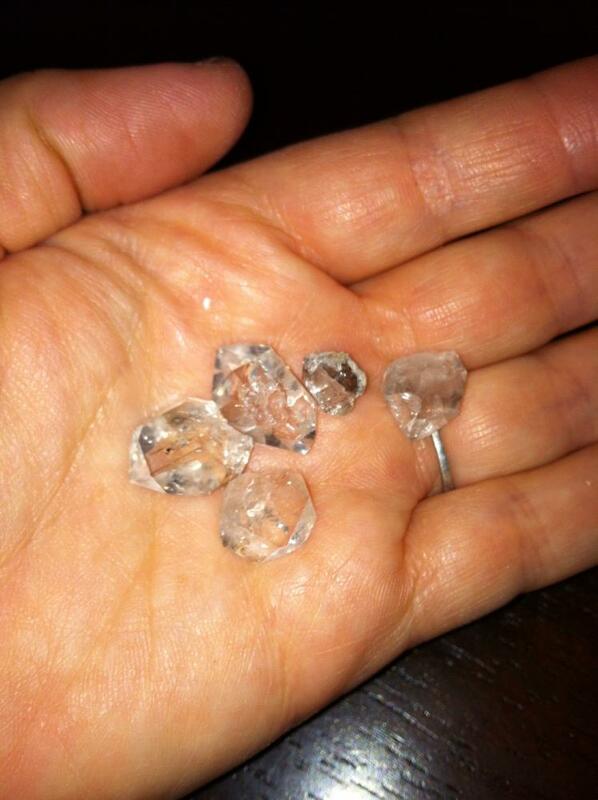 There are many crystal locations in Arizona but Diamond Point is known for the very clear double terminated crystals. Date Creek, Crown King and the Patagonia Mountains are a few of the other locations you should research. A few of the better locations are under claim but can be accessed by joining one of the local rock hounding clubs. Good luck and you have some nice finds so far. I think the designated collecting area is 14 acres although most people just dig next to the main road. Yes there are patches of crystals throughout the area to find. Take a hike and keep your eyes on the ground. Find one and there may be many more. Here is one of my largest ones from Diamond Point. Wow Adam!!! That is spectacular!!!! Where do the crystals originate from?? I saw many people digging this last weekend in the dirt next to the road, even though this isn't the digging season. I went up a little further and found several small ones and those in the picture. When I dig, what am I looking for exactly, what host rock? Are they just in the clay in the ground? Like I said, I was not digging..these were all float crystals on the surface. Very nice finds there sarahrose, but Geeeez Adam, that one's outa control. Are those actual carbon based diamonds or are some sort of perfectly pure/clear SiO2? I wish people would follow the rules there. It would be unfortunate if the area got shut down again. The host rock is limestone, and its all over up there. The crystals formed in Vugs /cavities along with calcite and sometimes aragonite. When your walking around in the woods keep an eye out for eroded vugs in the large limestone host. they will look like well formed potholes. while those have already weathered out it is an indicator that crystals are very near. The best intdicator is a crystal though. As I have found pockets with up to 16 crystals in them, so when you find one there could be more scattered about in the dirt topsoil. Heres a shot of the host rock....doesent look like much does it? But when you flip this rock over, we have an exposed calcite pocket and a beautiful crystal in its natural state. 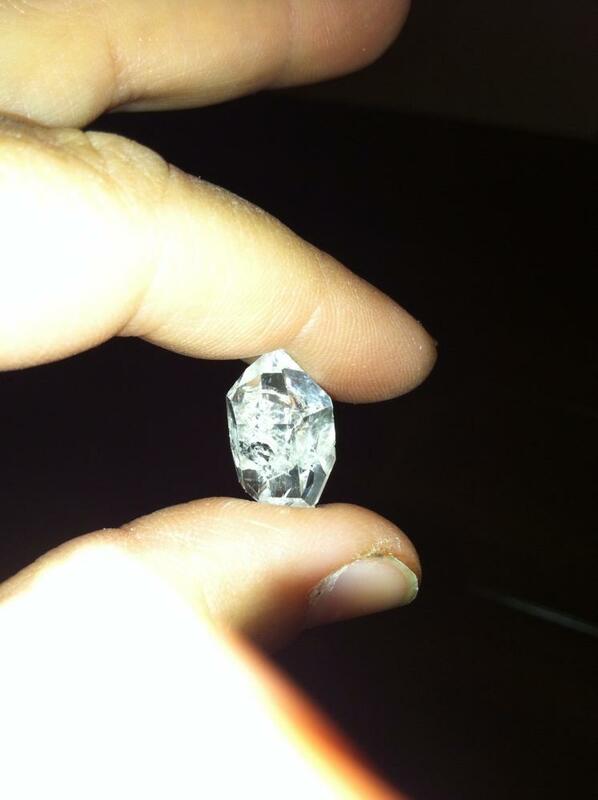 Here`s a crystal in a pocket that I removed the calcite from, leaving the quartz behind. Here are a couple of my finest specimens, two of which are slightly amethystine on the tips. The amethyst ones are rare, and are highly desirable. 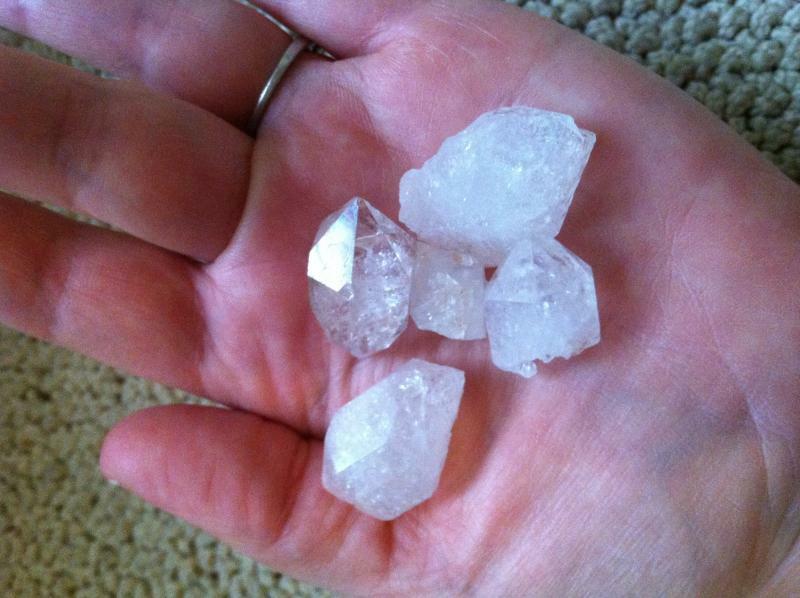 These are pretty much the same as Herkimer Diamonds, same crystal habit etc. The crystals have been eroding out of the vugs for thousands of years, I have found it easier to just dig through the first 6 inches of topsoil and look for the ones that have already come out. In non digging season or otherwise, I bring a small plastic garden rake. The rake is to quickly remove the pine needles and other debris so you can see whats underneath. its a great way to expose crystals that everyone just walks right by. Has anyone been to the geode site near there? I have..... Geodes all over..... Some with fantastic crystals inside!....... Most are duds, but the ones that are hollow and crystal lined make up for it. That is the location about a mile from the bridge on 64? Yes...we go on the road that is off the main road...you need 4WD to get over the first part of it, but after that it's easier....the road is literally covered with geodes...some are very large too. Watch out for the bees though..I got stung last time I was up there. Looks like you did pretty good. It is so easy to get turned around in the woods. Good Karma will come to you for rescuing the boy ...nice job ! Went up to poke around yesterday with my kiddo......the area seems soo over dug. Wandered a bit further down the road and found some bigger ones, but all of them were broken...pretty, but not whole. My son found a horny toad to play with for a while too, he loves those little things. Is this the only area to find the crystals? I remember someone telling me about kohls ranch area, and reading somewhere about the same crystals being found in the payette draw area. Lots of people collect along the road. The idea is to get off the beaten path, as the crystals are scattered all over several acres and well beyond. Like I said, bring a garden rake and rake off the pine needles down to the dirt. You will uncover crystals that may be laying right on the surface. I'll try that next time I go up... I saw someone on the other side of the road that the sign is on, so maybe I'll poke around on that side next time as everyone seems to go on the side the sign is on. Maybe I'll even go all the way up to the lookout and look around there as well. Someone was cracking open those huge boulders too , seems like a lot of work to me, but you can't find anything spectacular unless you look for it.